Advance Tabco PRD-19-30 Prestige Series Stainless Steel Free-Standing Bar Drainboard - 30" x 20"
Prep all your favorite beverages and more with this Advance Tabco PRD-19-30 Prestige series stainless steel free-standing bar drainboard. Items found within the Prestige series of underbar equipment line up perfectly with each other, creating a uniform look across any bar. In addition to a number of eye-catching features, this item boasts an exclusive twist-action leg assembly for added strength and an extended backsplash to create a truly one-of-a-kind unit. 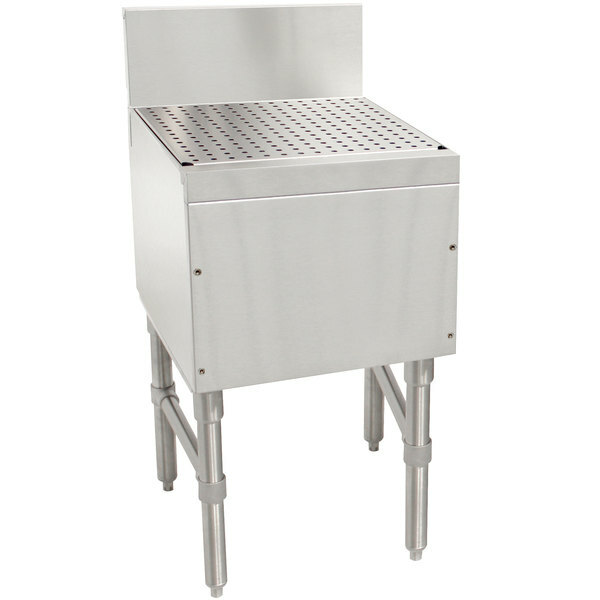 The perforated and removable drainboard is sound deadened in order to provide your operation with efficient, non-disruptive service. The unit also boasts a 1" IPS drain and is fitted with a 7" backsplash. Both features serve to keep users safe by reducing the potential for wet, slippery surfaces immediately around the unit, which ensures a safe and comfortable environment for your bar staff. The Advance Tabco PRD-19-30 Prestige series free-standing drainboard is the perfect addition to any bar or commercial kitchen.